thats the only way to hunt congrats. Good job Tradsmen4. Here's a couple of bucks I got last week on Kodiak. The little one I stalked and shot at 15 yards with a birch shaft and 125 Eclipse head. The bruiser I called in to 12 yards and shot with an Easton carbon shaft filled with wood and a Fishhead broadhead. 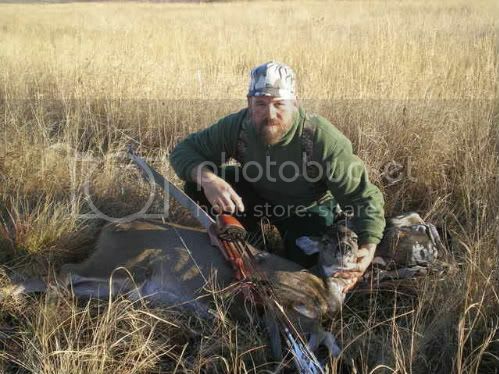 Used a Fox High Seirra recurve, 58# @ 26". I love hunting these deer. The largest of these two was no light weight like you find in SE Ak, this guy was pushing 200#. "I can explain it to you, but I can not understand it for you." Way to go TradesMan4, great deer. Can you give up any info on the hunt. I live in Fairbanks and would like to go to Kodiak next year to do the same thing, With my new Habu Vyperkahn! !